Sometimes life can be absolutely flippin marvelous. 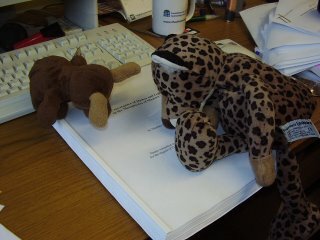 Savouring the taming of the thesis animal is one such time, especially when the beastie lies on the table, calm and sedate. Not a sign of the chaos that hovered around it like an incipient tornado. But looking back on it - I realise that the thesis animal wasn't just the product of a fevered brain and excited imagination. It also was the product of caring, love and support of different kinds throughout the years, but none of that is visible in the bound and restrained animal. It just looks like a product of brain, computer and ink. The thesis animal was tamed by many others: those who offered a tired thesis animal tamer courage, support, love, scoldings, and a bit of spoiling enroute. It belongs to all of them too. How can I ever forget that often achievements which we might gloat over are the product of the invisible hearts and hands undergirding it. Sometimes God's strength and grace come to us through human angels. Angels nevertheless.